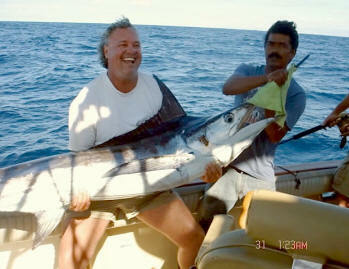 ​Exciting Cabo San Lucas Fishing and Sportfishing Charters, Fishing for Marlin, Tuna Dorado & More. Cabo Fishing from our fleet of professional 28ft - 42ft Sportcruisers located in Cabo and now also Puerto los Cabos. We also offer discounted Sportfishing/Hotels/Condos Vacation Packages! ​As one of the most highly recommended Cabo Fishing and Sportfishing Charter services in Cabo San Lucas, for over 26 years we have had the exciting opportunity to introduce a great many amigos to the fantastic Sportfishing of Mexico and Baja hospitality of the Marlin Capital of the World - Cabo San Lucas. Our Cabo Fishing business is built on the years of continued support and referrals from friends and clients like you. Our reputation comes from a tradition of providing exciting Cabo Sportfishing trips with local Cabo hospitality and knowledge at competitive prices. Family owned & operated for over 26 years. Cabo San Lucas located at the southern most tip of Baja California Sur Mexcio, gives Cabo fishing boats access to both the Pacific Ocean and Sea of Cortez, providing some of the most prolific Sportfishing in the world. Fishing the waters around Cabo continues to produce an epic number of multiple Marlin days - even when things are slow they are still pretty good. Marlin are caught year round as well as many other pelagic game fish species including Dorado, Tuna and Wahoo. The Cabo Fishing area boasts a hefty 40,000 billfish hook-ups a year! Now offering full or 1/2 day Charters on selected boats! ​Striped Marlin are routinely caught right outside the Marina but larger Blues and Sailfish are generally prowling the submerged banks around the world-famous Golden Gate and Jaime Banks on the Pacific side or the Gordo Banks on the Sea of Cortez side. A typical day's fishing involves pulling lures around these submerged banks and casting baits to Marlin, Sailfish, Dorado and Tuna along the drop-offs. We have over 26 years fishing in Cabo San Lucas, Family owned & operated. We provide the best all-in-one packages in Cabo. We are supporting members of Billfish Foundation and IGFA. We have some of the LOWEST PRICES we've seen in Cabo San Lucas! SPECIAL! Our most popular trip. Hosted by Fiesta Sportfishing! Fiesta 5 day Cabo Guided trips (26th Annual Cabo Trip) ; Nov 17-21st, 2019 on sale now from only $725pp Includes 5 days/4 night Wyndham Tesoro Resort, 2 full days fishing on 28' California Cruisers, round-trip Cabo Airport/Resort ground transfers & more. Book by May 15th and get a free upgrade to Jr Suite Marina View/Balcony room! CLICK HERE for more info. (2019 trip dates to be posted soon! Current Beach front Cabo Condo Special from only $605 ppp, 5days/4 nights at Terrasol Beach front Condo, 2 days Cabo Fishing on the 28' California "Carolina" plus round-trip Cabo Airport/Condo Ground transfers for 4 pax from only $695 per person. Valid Jan 16- June 14th 2019 CLICK HERE for more info! CLICK HERE TO SEE OUR ENTIRE FLEET! ​​Fishing from our 28'-42' professional Sportcruisers with clean, intelligently laid-out decks that are well-suited for the short runs and steady fishing action of Cabo makes for a great trip! See all of our boats! Have all the latest fishing tackle for the chair or stand-up. All tackle is in the 30#-130# class and is in top working condition. We have the latest in Penn rods and reels, plus all of the Marlin, Tuna, Wahoo, and Dorado lures you need. ​In addition, the boats are equipped with shade and facilities (restrooms). Your crew consists of an experienced native fishing captain and mate to help with rigging, finding, and hooking the fish. These are some of the most productive, finest, and fastest boats on Cabo! & now Extended day on select boats (10 hours approx) for longer runs. For more information, please contact us to request more detailed information or to inquire about reservations. ​Thank you again for hooking up with us! Join us on our Popular Guided 5-Day Fly-In Sportfishing trip! ​Cabo Fly Fishing or New fishing out of San Jose del Cabo Puerto los Cabos.